Properly maintaining your plumbing system involves a number of different steps, including scheduling maintenance and keeping an eye out for any issues that might come up. Most people tend to focus on the plumbing issues that occur in their home, though, and not on the possible issues that can affect things like the water line. The water line is the most important part of the plumbing system. 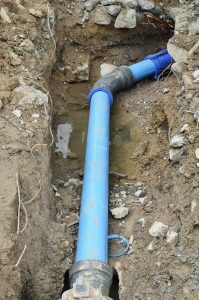 It is the pipe through which all fresh water flows before reaching your home’s plumbing system, whether you get your water from the city water main or some other source. If the water line is in good condition, then the rest of your plumbing system will run more smoothly. If the water line is dealing with a problem, though, it can seriously harm the plumbing. Read on for some examples of water line issues you should know about. There are two pipes that are absolutely vital for your home’s plumbing system to operate properly. These are the sewer line and the water line. All water that flows into your home’s plumbing system moves through the water line, while the sewer line removes wastewater to either the septic tank or the city sewer main. Since the entirety of your plumbing system relies on the water line to keep operating, it’s a good idea to make sure that it stays in good condition. Follow these tips to make sure that your water line stays healthy for as long as possible.